It's nice to be back in SoFL. 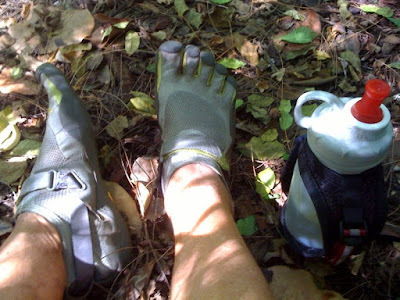 I had a fantastic run in the park this morning, on the trails in my Vibram FiveFingers. It has cooled down just a bit and is slightly less humid (but is still pretty hot and humid--just the way I like it!) I also got a pair of Nike Free's for Florida. They are a newer model than the ones I have in Wisconsin, fit slightly different, but are fine. I found this video on YouTube of Christopher McDougall; he talks about running and his book Born to Run. Thinking about the Nike Free, and how it didn't fit me... I thought I would try again, going up another half size. The first time I tried them, they were okay length-wise but too small width-wise, so I thought if I got a half size larger they would be too long. Well, I got them, the larger size, and wore them on Saturday, and they are great! They seemed a little long when I put them on, but they are okay running. In fact, they fit like a glove in the back and instep; my foot does not move at all in them. I have been doing my resistance workouts twice a week (not three times a week). I have a hard time getting myself to do it, but once I do, it makes me feel better... stronger. I go home to Florida tomorrow. A cool front went through while I have been gone... right on schedule--mid-October. Instead of being in the low 90's, it's now mid to upper 80's and less humid... 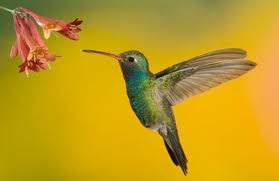 beautiful!! I am soooo looking forward to it! It is so hit and miss here. Today it is raining again, and I just can't get myself to go out and run in the cold rain. Elliptical again today. I was in southern California last weekend, L.A. It was unseasonably hot--low 90's! Those people were not happy! The older homes do not have air conditioning, so it gets very hot in the house when it's so hot outside. I only ran once while I was there... decided to enjoy the kids (my daughter and her husband) and give it a break. I didn't even run when I got back to Wisconsin--it was cold and rainy for two days. We got a little respite on Wednesday, so I went out and ran a nice, easy 10 miles. 60 degrees, sun peeking out from behind the clouds now and then, and no wind (that's the most important part). It is definitely fall here in Wisconsin. The leaves on the trees are gold and orange, red and yellow, and falling. But it lasted only one day. Back to cold rain, wind... and the elliptical. It's Sunday and I am in Wisconsin, flew in from South Florida on Friday. It's cold here, three in the afternoon and only 39 degrees! SoFL has had record high temperatures the past week (low 90's) so this is taking some getting used to! I did go for a short run yesterday morning, dressed appropriately (for me, anyhow)--two long-sleeved shirts, tights, hat and gloves. I came upon a young woman running in Vibram FiveFingers, and I just had to talk to her about them! She's been wearing them a few months, she said, and really likes them. She was doing some quarter mile intervals on the pavement in them. I didn't get to talk to her long because her watch went off signalling her to do another one. Pretty cool! This past week in Florida, I did more trail-running in the park in mine, plus a few barefoot beach runs. And last Sunday morning I met up with Jane after she had run about 40 minutes, to finish her long run with her. Her schedule called for a run of two hours and forty minutes. We had planned that she would run an hour before I joined her, but she got a late start. I did not really know how much I was going to run--was just going to run how I felt. Well, I did the rest of the run with her, a little more than two hours, which was around twelve and a half miles or so for me. It was slow, but it didn't matter. She just had to get the time in on her feet, I just wanted to run as long as I could, and we both enjoyed the time spent with each other. Back in the "good old days" when Jane and I were doing our hard marathon training, we would do "two-a-days" once a week (and occasionally twice a week) to get our mileage up. We would do seven miles at 5:30 in the morning, get our kids off to school, go to work and work all day, then meet again at 5:30 that evening for another seven miles. We typically would have done a speedwork session on Tuesday with a total of ten to twelve miles, recovery run on Wednesday, a two-a-day (seven in the morning and seven in the evening) on Thursday, off Friday, then a 20-mile long run on Saturday. Those were the good old days! On Thursday, I did a two-a-day: four miles in the park in the morning in my "froggy feet" (that's what Jane has dubbed my Vibram FiveFingers), then another four miles on the beach late that afternoon. Not exactly like the old days, but the same idea, I guess--getting some more miles in but giving your body a little recovery time in between. The beach was littered with "moon jellies," a kind of jellyfish that's very common in SoFL. They get stranded on the beach, and the waves can break them into pieces. I didn't bring my "froggy feet" to Wisconsin. I run mostly on a paved "rails-to-trails" path, and I don't think I'm ready for pavement in them. And, besides, the forecast here is continued cold and rain this week. I'm a Florida girl--rather run in heat and humidity than cold rain any day! So, I'll probably do a little less running, more gym work for a while. Okay, so this is about the best thing that's happened in a loooong time in my running. First of all, before I had surgery on my hip, I would run on the beach barefoot at least once a week. Let me tell you something... my most very favorite place to run is the beach. I love running on the beach! Well, I have been avoiding running on the beach because I figured it would be terribly stressful for my hip and I should not be stressing anything. Then yesterday, I decided I would run on the beach, because, I mean, what the heck, after all the babying I've given my hip/leg... I still hurt. 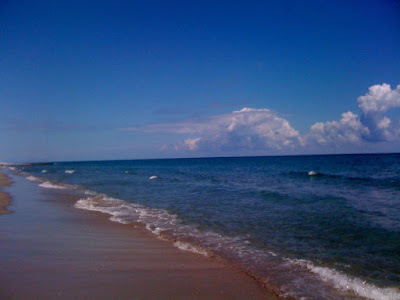 So, yesterday I did five wonderful miles on the beach--it was great! I got the Vibram FiveFingers... and they are just fantastic!! Ran three miles in them over at the park on the trails--no problem, and I think... I think... because running in them forces me to land midfoot--or even forefoot--that my body stays directly over my feet as I run. I take very quick, short strides, and my pace is slow, but I think it's correcting my form, and eventually the pace will just naturally pick up. It feels like you are barefoot; that is, you really don't feel them on your feet. They protect the bottoms of your feet, but you do feel any bumps you land on. I did not do too much on pavement; will work up to that. My Vibram FiveFingers... ugly! but very cool!! Growing up, my childhood was actually perfect for this running that I love to do. I grew up in the Midwest, and as soon as school was out for the summer, we were barefoot. We got a pair of flipflops (we called them "thongs" back then) and a pair of white canvas "tennies" (Keds tennis shoes) that we would wear if we had to wear shoes. But, mostly, we played and went everywhere barefoot. All the kids did. Our days were spent playing outside--jump rope, hopscotch, riding our bikes, swimming at the local pool... and at night we played running games--tag, freeze tag, kick the can, and the like. All barefoot. When I first began running, it was on the beach, barefoot. I was 37 years old, and enjoyed long walks on the beach. One day I just decided to run a little bit... and that was pretty much it. At the time, I was walking about three miles a day (not just on the beach). I would run as far as I could and then walk; then run again, and walk. After a couple months I could finally run the whole three miles without walking... then I felt I could run forever. I continued my beach runs at least once a week throughout my years of training. 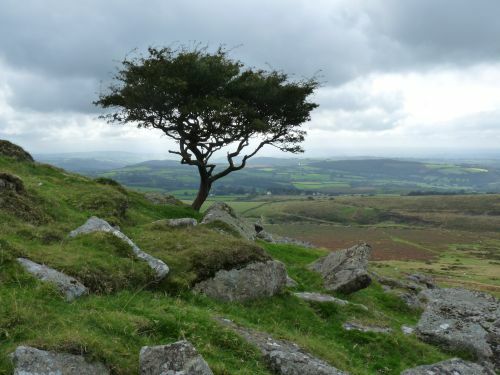 My very first ultra was a 55k in England in 2000, the Dartmoor Discovery 55k. 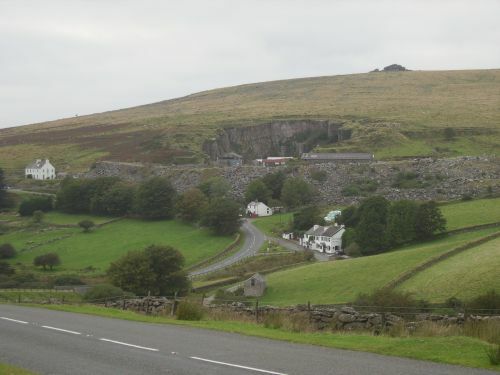 Down in southwest England, the moors are the setting for the Sherlock Holmes books. 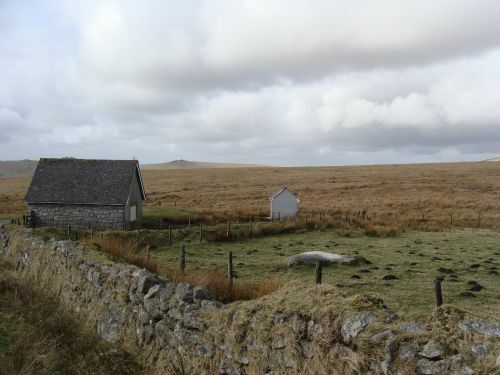 It's very bleak up on the moors--cool, misty, and kind of barren; not the lush green you think of when you think of the English countryside. And quite hilly. Long hills, steep hills. As there are no hills--none!--in South Florida, I decided that running on the soft sand of the beach might help build strength to help me run those hills in Dartmoor. I worked up to running 10 miles on the sand, then putting my shoes on and running up to the bridge over the intracoastal and running back and forth across that for about an hour or so. I won the women's overall in that race, and was met at the finish by none other than 92-year-old Johnny Kelley of Boston Marathon fame!! He and his wife used to winter there in Sarasota and somehow the club that put on the race had persuaded them to come. After the race, I washed my shoes, set them out to dry, and did not wear them till I put them on that Saturday morning of my first 50-miler. Boy, was that stupid! At the time, I was in the habit of getting to races at the last possible minute before the start. I had put my shoes on in the car on the way to the start, which was at 5:00 am. When I put my shoes on, I had to loosen them up to get them on (they were kinda shrunken from being washed in the washer), and tied them up, not giving it a second thought. I (stupidly) did no running in them before the start of the 50-miler. I did not realize that they were too loose on my feet. Getting to the start area, I got all my stuff ready (water bottle, Gu's, s-caps, Clip, aspirin), went to the bathroom a couple times, and we were off and running. 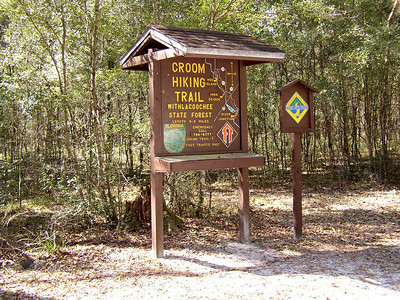 The Croom Trail in the Withlacoochee Forest in Central Florida is hilly and sandy. Not terribly big hills, but hills just the same, and sandy. Well, with my shoes kinda loose on my feet, on the downhills my feet would slide down and my toes would bang against the ends of my shoes. The 50-miler is three loops around the trail, with several series of ups and downs each loop. After a couple loops of the "downs" my toes started to really hurt. That's not so unusual; everyone who does marathons and ultras gets bruised toes. Well, then they started to really hurt, and it got so bad, that I just couldn't run anymore, hurt too much. I kept trying to run and couldn't; walked, tried to run again, and couldn't. Finally, I sat down on the trail and pulled off my shoes. My toes were a bloody mess! On inspection, I found that five of my toenails were actually completely off the nail bed, and three others were just hanging on. But, what else I found was... that it was such a relief not to have my shoes on! I knew I was not far from the next aid station, so I picked up my shoes and started running. It felt so good to have my toes free! It was about a mile to the aid station. When I got there, my feet were filthy, a mess! I sat down in a chair and the woman who looked at them asked if I was going to quit or keep going. It was another seven miles to the finish, and she said it wouldn't do any good for her to try to clean them up if I was going to keep going. As I had not been running very much over the last six or seven miles, I actually felt pretty good... so I decided to keep going, barefoot. The Croom Trail is mostly sand and soft dirt; no rocks, but there are parts that do have lots of roots. Those were the killers--catching a toe on a root! But I finished, and won the women's masters title! Ran the last eight miles of my first 50-miler barefoot!